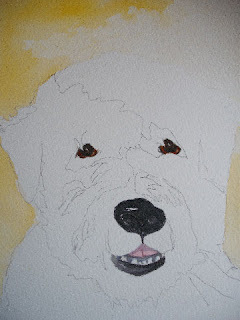 The Alphabet Paintings from the Painting Friends forum continue..
On the Painting Friends forum I belong to, we currently have a Portrait Fun challenge going on. I'm not that used to doing portraits, so elected to try this photo in one colour only. I used Burnt Sienna and this is what I produced. Every time her daddy comes home from work, Missy is delighted. Usually she races round like a young pup and fetches a toy for him to play with. But this time, she jumped on a dining chair and had a fuss! I quickly took the camera out - and whilst these photos won't win any photography prizes - Missy looked so happy, I wanted to share them. Do you have a pet who makes you happy? 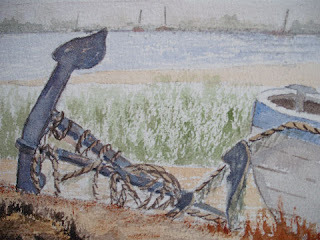 Painting Like the Masters Challenge on the Painting Friends forum is this month Berthe Morisot. You can read all about her, here. Here is my watercolour version of her oil painting of a serving maid. 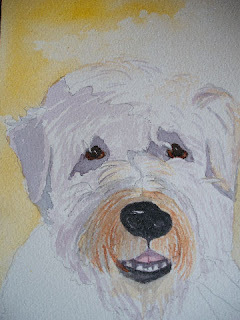 On the Painting Friends forum, we have a challenge called Alphabet Soup. We received a surprise in the mail! It came from Nicola, who is the lady I painted "The Diamond Roxy" for. whilst I like to munch! if I give a paw, can I have another, please? Continuing with the dog painting, here is stage 3, painting the eyes, nose and mouth. 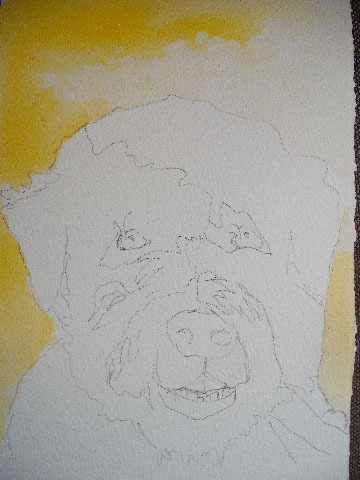 and stage four, painting in some shadows and colour around the muzzle. On the Painting Friends forum I frequent, we have a photograph posted each Friday, and those who wish to can join in and try to paint it. So when a dog came up as a Friday Foto, I had to give it a go. In both of these stages, I have painted some underglazes to the main body of the owl. After these two are done, only the top washes remain to do. 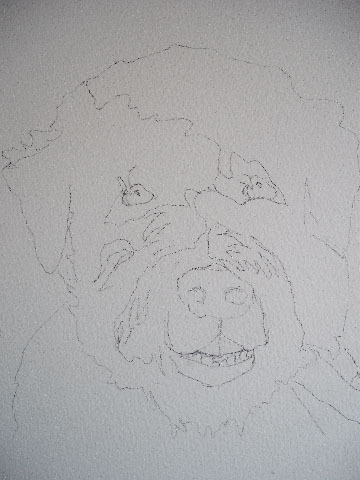 So on Monday, you will see the finished painting. 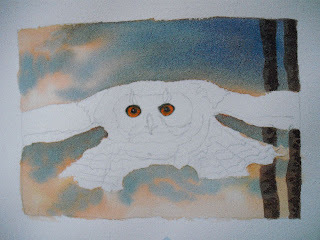 I painted in a couple of slender tree trunks on the right of the painting, to suggest that the owl is coming out from a group of trees. 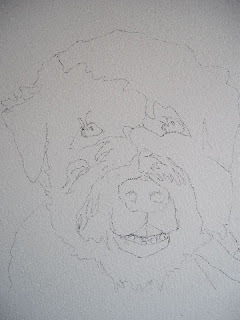 In the next stage, I have painted his eyes. They give me the feel for the character of the owl. 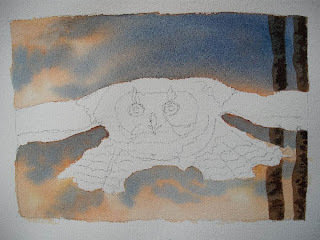 Today I'm showing you the first two stages of my new painting, which is an owl in flight. Photo courtesy of my friend Lynne. 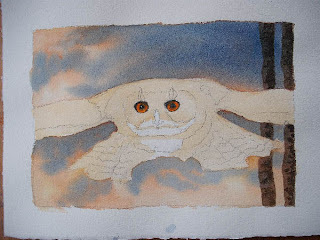 First is the drawing - and I have deliberately let the wings go out of the painting, to give it a different "feel"
Next comes the background, a mix of colours to suggest night is coming..